They are the most versatile because every pallet position (SKU) has aisle access for full pallet or case pick. More access, however, means less density because of numerous aisles. 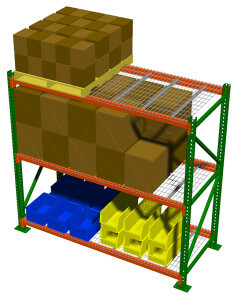 In pallet rack systems, the more selectivity you have, the less density of the pallets stored (number of pallets deep). Conversely, the more density you have, the less selectivity of the pallets stored (access from aisle). The development of pallet rack progressed with the development of forklift trucks. The first racks averaged only 10’ high; today heights of over 20’ are common. These, like all pallet rack structures, particularly, in earthquake zones, like Southern California, are subject to stringent structural and fire code requirements. Shelf Master, serving industry for over 40 years, has the experience to guide you through a successful project.